Well hello today,given that the desolation of Smaug is coming up on December 13th (Yes I am super excited for that! )..I shall talk about The Hobbit:An Unexpected Journey treatment would be like if it was under Gullimero Del Toro’s treatment in terms of narrative and perhaps design-wise… I decided to write this because there is a comment which I read that there is some resemblance of Del Toro’s treatment for J.R.R Tolkien’s The Hobbit despite Peter Jackson’s direction to the film itself. For those who followed the production of The Hobbit would be aware that Peter Jackson was considering to adapt the Hobbit in 1997 but decided to explore LOTR. After the success of the LOTR Trilogy (2001-2003),there Peter Jackson explored the idea of creating the The Hobbit. When announced in 2008,it was said that Del Toro was attached to that project as screenwriter and director. However due to creative differences-Del Toro left the project but he was attributed as screenwriter for the film. Therefore I would dissect the aspects of the narrative which is similar to Pan’s Labryrith and the Hobbit. For The Hobbit,it gives a sense of warmth for those familiar with the LOTR trilogy where the main protagonist (Old Biblo Baggins played by Sir Ian Holms) was recalling a warm memory and we are cut to a sketch of young Biblo (Martin Freeman of Sherlock fame) and here we are transported to the events before the Hobbit. For Pan’s we are transported to Ofelia’s dying moment and we zoomed into her eye,the remaining memories as the princess of the underworld. There it zoomed to the destruction of Fascist Spain which shows the contrasting world where Ofelia lived. Both opening scenes needed the use of fairy-tale narration to create different tones,for The Hobbit,it was used as if Biblo is retelling his experiences to us in personal perspective and perhaps to his nephew Frodo. He is giving us his perspectives on the things he seen and do. It reels us back to that feeling when you watched LOTR again,the comforting feeling when we seen the Hobbits in the shire. On the other hand,Pan provides a somber tone of the situation Ofelia was facing and her predestined destiney. Secondly it was seem that both films used on the 3 tasks plot,to illustrate the character’s journey and growth in the story. For Ofelia (Moanna),these tasks symbolize on Ofelia’s outcomes,for the first task on getting the key from the toad that inhabit the tree represents either her baby brother who caused problems or the rich fascists who sucked the money according to Matt Graeff’s analysis on the creatures in Pan’s Labriyrith,which cuts to the rich people eating dinner together. These tasks could symbolized the female sexual awakening for Ofelia herself especially when the tree represent the female reporductive organ which Del Toro do mentioned on the warm “womb-like” tones for the underworld especially in the end where Ofelia wore a red coat and yellow dress in contrast of the forest-like colors of the real world. On the other-hand Biblo was accomplished with a huge task of defending the infamous dragon Smaug,at first he was approched by Gandalf wearing the colours of yellow and turquoise that symbolized his stable and safe place in Hobbiton. He refused that task,and later unexpectedly seen a company of dwarves as he wore his patched dressing gown to show a breaking of his comfort zone. However during his push to go on an adventure,he was wearing his ‘adventure’ outfit which echoes Holms’ outfit in LOTR. He accomplished his first task as the Burgular,to accomplish his task as the burgular. Perhaps what is the most symbolic of the tasks in the unexpected journey Biblo have to do,is the cave scene especially on the ripping off the brass buttons which ultimately showed his unintended push and eventually he grows to be more courageous which paid off in his fight-off with Azog. His dirtied down clothes shows on his readiness to save Erbor and show that he pushed his comfort zone out to be more courageous physically and mentally. 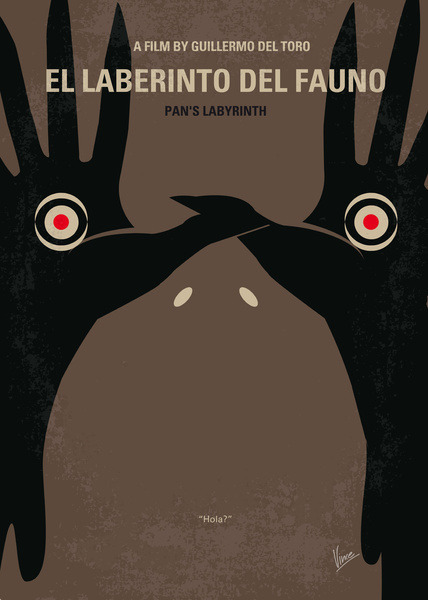 Thirdly I could see some thread of Del Toro’s influence in the narrative in An Unexpected Journey,is perhaps the use of vast influences from different literary and artistic influences into their mise-en-scene and story. In conclusion,white it was a pity that we would never seen the full impact of Del Toro’s vision of Tolkien’s Middle Earth. I could see little remants of Del Toro’s influence on the narrative,the various influences of the story of The Hobbit provide fertile imagination perfect for Del Toro’s hands. There he provided us a perfect fairytale narration to set the tones of the films,like Biblo warmly recollecting the memories of past and Ofelia’s predestined fate. The tasks these protagonists have to hold to achieve themselves higher,like Biblo’s experience in the caves make him grew up as a courageous character and Ofelia’s sexual growth by her tasks assigned by the faun which she was rewarded to immortality and happiness in the underworld. Indeed both films provided worlds for us to escape into and perhaps get lost here.